The magic of this painting lies in the very subtle movement of the girls. Heads are moving in carefully articulated angles and arms are creating a pattern of movement. 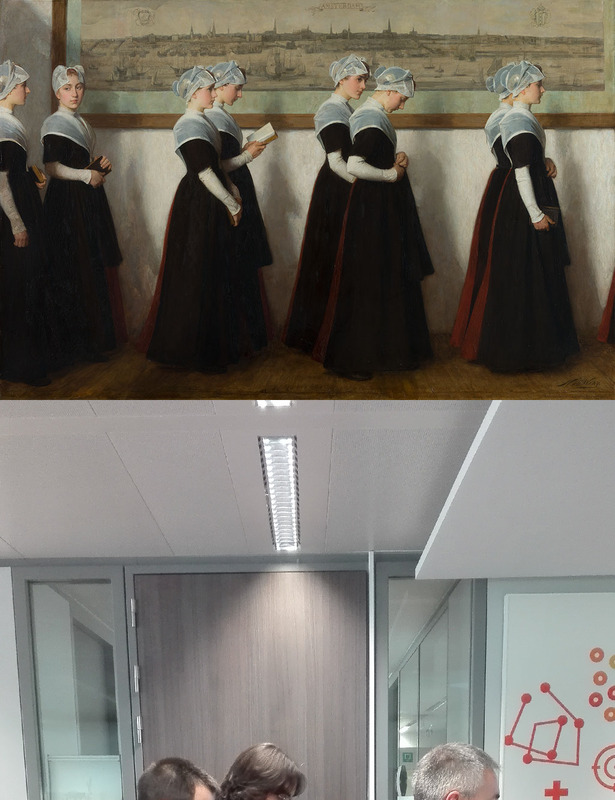 The uniformity of the traditional black costumes also play a role for the atmosphere of the painting. Try to recreate this with modern cloths if you don't have costumes. And do not forget the little book in the hands of one girl. It's the focus point of the image. 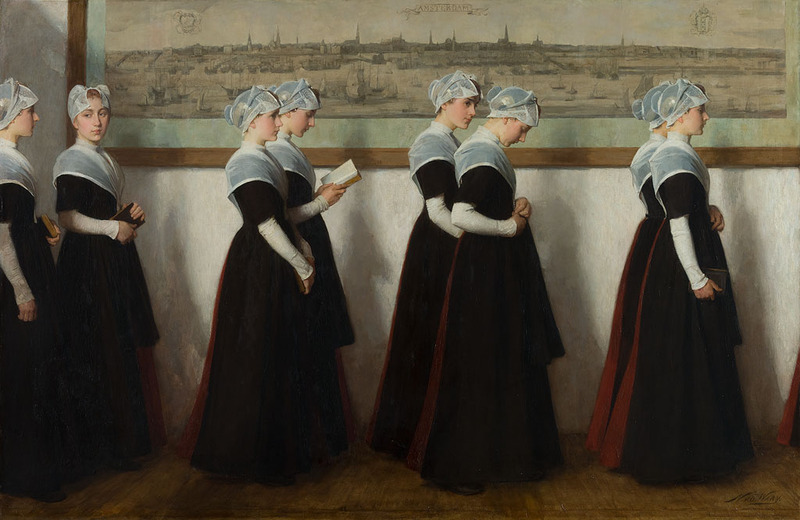 Nicolaas van der Waaij was fascinated by the timeless look of the Amsterdam citizen orphan girls. 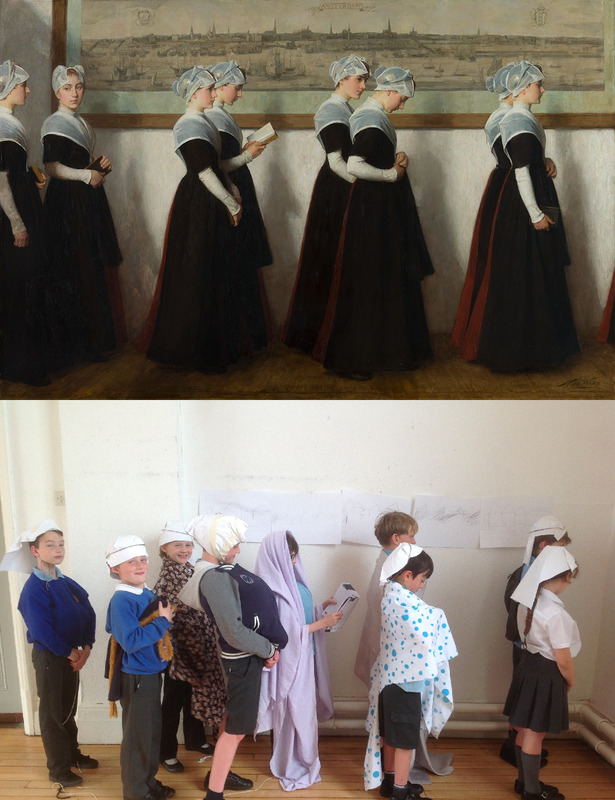 He made a series of paintings and drawings of models dressed in the red and black costume of the citizen orphans. His paintings idealized the appearance of the orphans, who seem to be shrouded in some transcendent charm: some sort of charm seem to emanate from these girls, which probably had nothing to do with the realities in the orphanage. In this painting, the Sunday church attendance of the orphans is pictured: every Sunday the boys and girls walked in a long procession from the Orphanage to the Westerkerk at the Prinsengracht or to the New Church on Dam Square. The orphans had their own place in the church.